You are here: Home / Life / Retire and relocate? *Post may contain affiliate links, where your purchase generates a small commission for me at no added cost to you. As you plan your retirement, you might be thinking about whether you should move. For years your job, kids’ schools and other connections have kept you in the same place. Soon you’ll get to consider whether you want to stay in the community you know, or whether you’d prefer to retire and relocate. When you face different choices for where you’ll live in retirement, how do you decide? Options include staying in your same home, downsizing to a different home in the same community, moving to a new community or new state, or even moving overseas. This post will offer ideas to think about as you start planning for where you’ll live in retirement. The first step in considering whether you should retire and relocate is to project your future needs and wants. While it’s hard to know what events might come your way (a major illness, for example), you can still map out your preferred path. Just be sure to leave room for unexpected circumstances or contingencies. The immediate thing to consider is your ideal home configuration. You should write down needs and wants in two separate lists. Your needs and wants will change as you grow older. This doesn’t mean you should limit your options early on. But recognize that a little upfront planning will help you transition more smoothly. For example, in the early years of retirement, you may travel frequently. You may enjoy dining out in local restaurants and/or attending cultural and sports events. But as time goes on, you’ll probably choose to spend more time at home. Moving to a new community can be fun, especially if both spouses are alive. You’ll have a built-in friend but also get to meet new people and experience new things. And yet, when one member of the couple dies, the remaining spouse might miss living closer to other family members. You shouldn’t plan for every contingency. Nor should you let people convince you to act older than you feel (take inspiration from Diane Keaton’s character in The Book Club*). At the same time, do your best to project your needs and wants at different ages as you consider whether to retire and relocate. If you’ve decided you want to retire and relocate to another city, start your adventure by renting in the new location. You can cover your costs by renting out your own home. Or if you know you don’t want to continue living in it, go ahead and sell it . Avoid transaction costs. You don’t end up buying and then selling a house in a place you decide you don’t want to stay. Learn about a new city as a “local.” If you rent before buying, you’ll get to learn first-hand about neighborhoods and decide where you want to purchase a home. Stay flexible. For example, you might move to be closer to your children and grandchildren. Then two years later, your daughter’s company promotes her and moves her to corporate headquarters. Do you stay or do you go? Although most baby boomers still own their homes, urban areas in particular appeal to this segment. US News reports that almost one-third of current urban TenantCloud applications are for renters over age 60. And Freddie Mac survey data projects that over 5 million baby boomers expect to rent their next home. In many parts of the United States, homes are places you live – not investments. Nobel Prize-winning economist Robert Shiller calculated that, over the past hundred years, the average home in America has appreciated less than 1 percent per year over the rate of inflation. That’s far less than most people earn investing in stocks or bonds. However, real estate appreciation in some parts of the country has outpaced Schiller’s average. In places like the San Francisco Bay Area, people’s retirement plans often depend on their built-up home equity. By choosing to retire and relocate, they can sell their expensive homes in California, buy or rent elsewhere for much less, and then live off the difference. Whether you rent short-term to check out a new location, or long-term for other reasons, consider renting as an option when deciding whether to retire and relocate. While you’re thinking about whether to retire and relocate, give some attention to the setup your present home offers as you get older. For example, my knees are already creaky. So when I imagine 10+ years in the future, I’m guessing I’ll want a single story house, ground floor condo or building with an elevator. It may be cheaper to remodel your present home to make it safe and comfortable as you age. Or you may want to move. In either case, try to anticipate future needs. You can choose universal design features that are beautiful as well as functional for you now and as you age. The result will be more pleasing than resorting to last-minute fixes if you wait until an emergency requires you to install grab bars, etc. To start thinking about aging in place concerns, check out this post. For a comprehensive checklist, download AARP’s Home Fit Guide. There are lots of factors that go into your decision about whether you want to retire and relocate. Spending time anticipating your needs and wants will help you transition more smoothly when the time comes to do so. You don’t need to be in a rush to make your decision. Retirement may really mean semi-retirement or a more independent work schedule than you had in your prior career. You may not be able to know what you want from your home base until you’ve gone through this important work and life transition. Just don’t avoid the subject completely. Keep thinking and talking with your mate about what you might want to do. Crunch the numbers. If you’re remodeling your home anyway, make sure to add some universal design features that will help you and others who visit you stay safe and comfortable at any age. The decision to retire and relocate is a big one. Take time to consider it from multiple angles. Make gathering information about this decision a fun project. You never know what adventure may lie ahead of you. 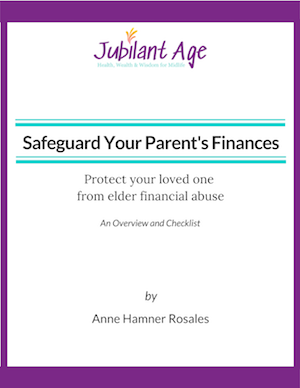 Subscribe to Jubilant Age and download a free guide to protecting your loved one's money! Previous Post: « Are you a family caregiver? I'm a midlife traveler like you, eager to share what I'm learning about making midlife a Jubilant Age. I also want to hear your perspective-- let's start a conversation! Click here for more details.